A woman carries her heart, broken into nineteen pieces, in a small paper bag. A man shrinks to half his former size, after losing hope in love. A couple keep the love they have given each other in large red bags, or compress the mass into the size of a diamond. 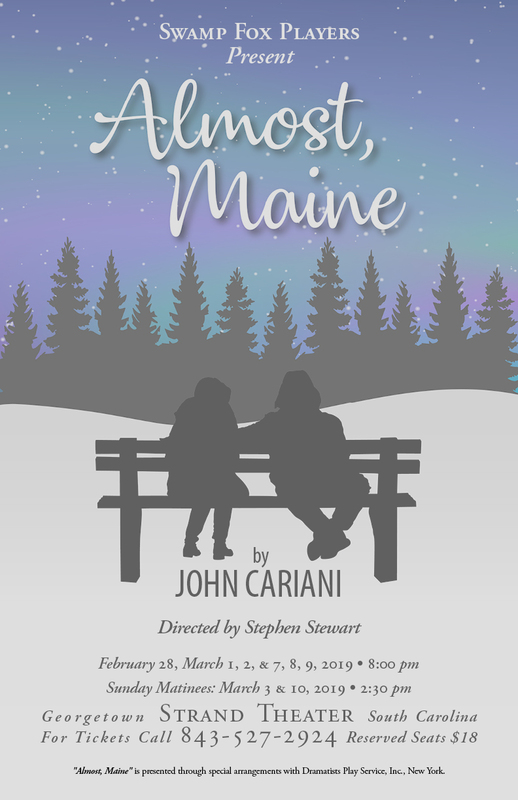 These playful and surreal experiences are commonplace in the world of John Cariani’s Almost, Maine, where on one deeply cold and magical Midwinter Night, the citizens of Almost -- not organized enough for a town, too populated for a wilderness -- experience the life-altering power of the human heart. Relationships end, begin, or change beyond recognition, as strangers become friends, friends become lovers, and lovers turn into strangers. Propelled by the mystical energy of the aurora borealis and populated with characters who are humorous, plain-spoken, thoughtful, and sincere, Almost, Maine is a series of loosely connected tales about love, each with a compelling couple at its center, each with its own touch of sorcery.